Have you ever wondered if the Bible is accurate to the original manuscripts? Q: Do we have evidence in manuscripts and ancient writings? A: Yes, we have tons of evidence. More original texts than any other writing in those times by a long shot! Old Testament: Dead Sea Scrolls – Discovered 1947 – Some 800 different manuscripts would be found in eleven caves near the valley called Wadi Qumran. In all, some 60,000 fragments, portions, or complete scrolls of these 800 manuscripts were retrieved, covering many subjects. Either fragments or complete copies were found of every book in the Old Testament except Esther. They had been placed in these caves around the middle of the first century AD dating back to 408 BC, and the amazing fact is that they had lain there undisturbed for 1900 years! New Testament: The quantity of New Testament manuscripts is unparalleled in ancient literature. There are over 5,000 Greek manuscripts, about 8,000 Latin manuscripts, and another 1,000 manuscripts in other languages (Syriac, Coptic, etc.). In addition to this extraordinary number, there are tens of thousands of citations of New Testament passages by the early church fathers. In contrast, the typical number of existing manuscript copies for any of the works of the Greek and Latin authors, such as Plato, Aristotle, Caesar, or Tacitus, ranges from one to 20. Q: So we have a lot of manuscripts, but are they quality? A: Yes and they are precise. Old Testament: Because of the great reverence the Jewish scribes held toward the Scriptures, they exercised extreme care in making new copies of the Hebrew Bible. The entire scribal process was specified in meticulous detail to minimize the possibility of even the slightest error. The number of letters, words, and lines were counted, and the middle letters of the Pentateuch and the Old Testament were determined. If a single mistake was discovered, the entire manuscript would be destroyed. The Dead Sea Scrolls confirmed that the number of differences carried down through the centuries were negligible. New Testament: Due to the thousands of early manuscripts and citations, the New Testament can be regarded as 99.5 percent pure, and the correct readings for the remaining 0.5 percent can often be ascertained with a fair degree of probability by the practice of textual criticism. Check out this early 2nd century biblical fragment! Q: Well, what about the time span…isn’t it hard to record stuff over long periods? A: The Bible has an amazing track or recording and all of the authors wrote their own works shortly after or during the events of the Bible. Our records today also show an amazing accuracy from one time period to the next. In addition, we have early copies, more than any other book of that period to back it up! Old Testament: The Septuagint was translated at the request of Ptolemy II by 70 or 72 Jewish scholars (6 from each of the 12 tribes of Israel) who independently translated identical versions of the entire Hebrew canon. The first five books of the Old Testament, known as the Torah or Pentateuch, were translated in the mid-3rd century BCand the remaining texts were translated in the 2nd century BC. The Dead Sea Findings also, dating back to 400 BC give us the earliest versions. Thus the writings are confirmed from 1400 – 400 BC. New Testament: The time span of the New Testament manuscripts is exceptional. The manuscripts written on papyrus came from the second and third centuries A.D. The John Rylands Fragment (P52) of the Gospel of John is dated at A.D. 117-38, only a few decades after the Gospel was written. The Bodmer Papyri are dated from A.D. 175-225, and the Chester Beatty Papyri date from about A.D. 250. 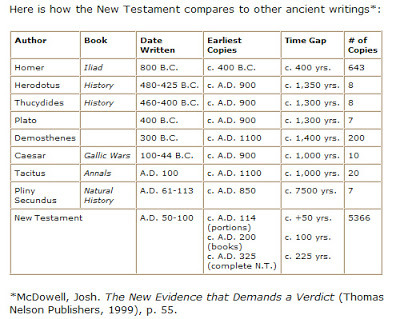 The time span for most of the New Testament is less than 200 years (and some books are within 100 years) from the date of authorship to the date of our earliest manuscripts. This can be sharply contrasted with the average gap of over 1,000 years between the composition and the earliest copy of the writings of other ancient authors. Let’s look at the internal and external test. A number of biblical authors claim that their accounts are primary, not secondary. That is, the bulk of the Bible was written by people who were eyewitnesses of the events they recorded. John wrote in his Gospel, And he who has seen has borne witness, and his witness is true; and he knows that he is telling the truth, so that you also may believe (John 19:35; see 21:24). In his first epistle, John wrote, What was from the beginning, what we have heard, what we have seen with our eyes, what we beheld and our hands handled concerning the Word of life . . . what we have seen and heard we proclaim to you also (1 John 1:1, 3). Peter makes the same point abundantly clear: For we did not follow cleverly devised tales when we made known to you the power and coming of our Lord Jesus Christ, but we were eyewitnesses of His majesty (2 Peter 1:16; also see Acts 2:22; 1 Peter 5:1). The independent eyewitness accounts in the New Testament of the life, death, and resurrection of Christ were written by people who were intimately acquainted with Jesus Christ. Their gospels and epistles reveal their integrity and complete commitment to the truth, and they maintained their testimony even through persecution and martyrdom. All the evidence inside and outside the New Testament runs contrary to the claim made by form criticism that the early church distorted the life and teachings of Christ. Most of the New Testament was written between A.D. 47 and 70, and all of it was complete before the end of the first century. There simply was not enough time for myths about Christ to be created and propagated. And the multitudes of eyewitnesses who were alive when the New Testament books began to be circulated would have challenged blatant historical fabrications about the life of Christ. The Bible places great stress on accurate historical details, and this is especially obvious in the Gospel of Luke and the Book of Acts, Luke’s two-part masterpiece (see his prologue in Luke 1:1-4). Because the Scriptures continually refer to historical events, they are verifiable; their accuracy can be checked by external evidence. The chronological details in the prologue to Jeremiah (1:1-3) and in Luke 3:1-2 illustrate this. Ezekiel 1:2 allows us to date Ezekiel’s first vision of God to the day (July 31, 592 B.C.). Paul. The traditional view is that Paul was beheaded in Rome during the reign of Nero in AD 64 to 67. James, the Brother of Jesus.The first evidence for the death of James comes from Josephus in his Antiquities 20.197–203 (c. AD 93/94). Thomas. The traditional story is that Thomas traveled to India where he was speared to death. Andrew.Written record of the martyrdom of Andrew comes from the Acts of Andrew(c. AD 150–210). Known Others and Biblical: John the Baptist was imprisoned and beheaded (Matt. 14:1–11). Jesus was crucified. Stephen was stoned to death after his witness before the Sanhedrin (Acts 6–8). And Herod Agrippa killed James the brother of John (Acts 12:12), which led to the departure of the rest of the Twelve from Jerusalem. The first statewide persecution of Christians was under Nero (AD 64), as reported by Tacitus (Annals 15.44:2–5) and Suetonius (Nero16.2). So you ask: How Prevalent is Discrimination Against Christians Today? This B-I-B-L-E of ours is rather amazing and for thousands of years, it has stood the test of time and survived every major catastrophe of humanity and this world. That includes people abusing their power with it, going to war, persecutions, attempts to destroy and burn, mass genocides, etc… God continues to give us His word through it all. With today’s technology and study, we have been able to give wonderful evidence of all kinds to support to the accuracy and authenticity of the the Bible. So, I pray that this finds you well! If you want to get a copy of my suggested Bible, the most accurate English version I can find, then click on one of the links below in the footer of the web page to get either a reference or study Bible. Also, be sure to read my post on Best Bible Translations if you want to know why I suggest these Bibles.